Julie Golob is one of my shooting idols. It's not just because she's enjoyed great success at international and national levels as a top-flight action-pistol shooter. It's also because we share an abiding belief: Competition shooting is one of the best ways to attract new shooters and keep current shooters involved and active. Her new book, Shoot: Your Guide to Shooting and Competition, is a paean to that idea. 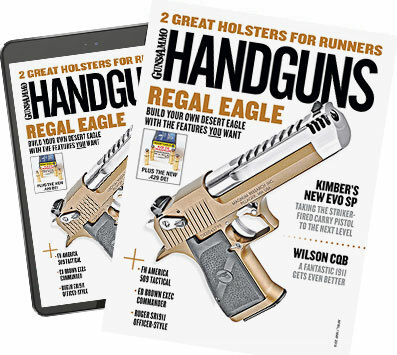 In its 272 pages it covers the shooting sports from Bullseye pistol and 3-Position smallbore rifle to USPSA pistol and 3-Gunâ€”and everything in between. While it professes to be a book applicable to all levels of experience, it is essentially an excellent guidebook for those new or relatively new to guns or those who are looking for a different way to enjoy shooting. Shoot covers it all. Heck, I've shot most of the rifle disciplines, and I learned of a few I didn't even know existed. Julie leaves no stone unturned, detailing how they're shot, how they're run, what you needâ€”whether it's handgun, rifle or even shotgun. At its best, though, Shoot is a handgun book, with excellent discussions focused on action shooting disciplines such as IPSC/USPSA, IDPA, Steel Challenge and Bianchi. If you are interested in taking up one of these, you'll get a good grounding here. If you're already a grizzled handgun-shooting veteran you're probably not going to learn a new grip or stance that will suddenly vault you into the next classification, but you might learn or re-learn some techniques that can help you improve. I think Shoot's strength is as a primer for new shooters or those looking to broaden their horizons, and if you're a club that supports new shootersâ€”from junior leagues to attracting novice adult shootersâ€”you need to have this book not just as a great reference but also to hand out to promising recruits. A shout-out to Skyhorse Publishing: The book is very well designed. So many books of this type are dark and dense, trying the patience of even the most interested reader. Shoot employs a reader-friendly typeface, nicely leaded (the space between lines of type), with good photography to complement the text. While all that sounds like inside baseball stuff coming from a magazine editor like myself, a book that's easy to read beats one that's not every time. My print review of this book will appear in a future issue of Handguns magazine, and the main difference will be that it will include observations from my wife, a knowledgeable hunter and rifle shooter for whom competition shooting and handgunning are largely foreign. I asked her to take a look because I'm really interested in her comments as a long-time gun owner who really hasn't, up until now at least, considered becoming an active competitor. Why? In the end, I think this book excels at peeling away a lot of the mystery that prevents people from taking the guns they already own and shooting them on a regular basis. And that, at least at the grass-roots level, is what competition shooting is all about. In this regard, Julie's book is just what the doctor ordered. Aside from adoption by clubs I mentioned earlier, I think this is also a terrific primer on shooting to give to the significant other in your life. Let's face it: Those of use who are passionate shooters aren't always the best teachers of the ones we love (yes, guys, I'm looking at you). A book such as Shoot can go a long way toward helping a new marksman make his or her own decisions about what interests them in the shooting world. If I have any criticism of Shoot, it's that I'm looking forward to a book from Julie that will really delve into advanced tactics in both action pistol and 3-Gun (which Julie has recently taken up). To that end, I hope a Shoot II is on the horizon. Shoot: Your Guide to Shooting and Competition by Julie Golob, 272-page softbound, Skyhorse Publishing, list price $17. Available at Amazon, Barnes & Noble and other book retailers.